I first went to the US three years ago. That time I had a small suitcase and a backpack. This time, however, I was worried about having to repeatedly go back and forth in New York, as the friend who hosted me lives in Brooklyn, and my flights were to and from Newark. Good luck running up and down in those subway stations! Having practiced on so many Ryanair and Wizzair flights, I decided to travel light and only took a backpack and a handbag. In total, I had two pairs of shoes (sandals and loafers), four T-shirts (including an old one for sleeping, which I could have tossed away if I needed extra space), two pairs of pants (I got an early birthday present from a friend – pants that have detachable parts and double as shorts), a thin windproof jacket, a dress, one top with long sleeves, one with medium sleeves, and one that is basically only sleeves, as I wrote in the blog post about religious places. This allowed me more than enough combinations for eight days – had I not expected any semi-formal events, I could have done with less stuff. Of course, I needed various other things. For example, the university dorm I was staying at for a part of the trip charges extra for bed linen. Obviously, I wouldn′t have gone broke paying this, but I used the opportunity to try out a recent purchase. Here is some stuff which really helps me travel light. Before leaving Lithuania, a Japanese friend of mine gave away some things she no longer needed, so I still enjoy amazing Japanese design, which really helps me in my travels. On the left is my tiny Japanese umbrella, which fits anywhere and is much stronger than cheap small umbrellas I have had before. At the bottom right is a simple hook – quite surprising to realize what a difference it makes in public toilets that are neither designed for hanging heavy backpacks nor have a reliably clean floor to put a backpack on. This time I had no laptop with me, but when I do carry one, I fear for its life if I need to hang it on door handles or tiny sticks on public toilet walls. At the top I have an Ikea inflatable pillow, which I, fortunately, didn′t need for the longer leg of each flight, as pillows were provided. The red thing is a small backpack that folds into this pocket – great stuff, exactly the size of a Ryanair small cabin bag and perfect for situations where too much stuff in my handbag would give me backaches. 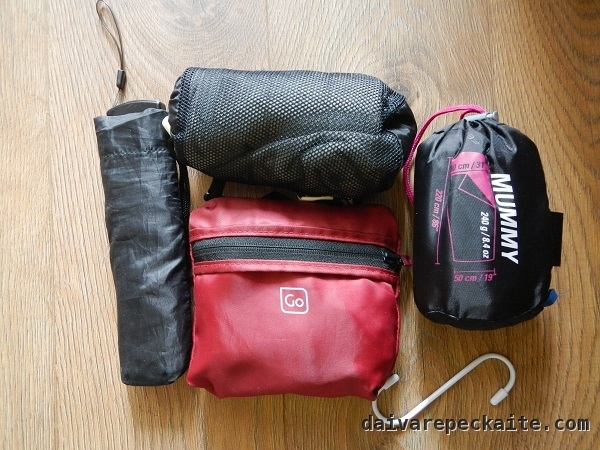 Finally, there is this beautiful thing – Ferrino Mummy inner layer for a sleeping bag, which takes little space and is certainly enough as a sleeping bag in summer. Needless to say, I had lots of small things in my luggage – a power bank, a tablet, a camera and various chargers (I had a charger with replaceable European and American plugs as a conference souvenir – great idea, but it was soooo slowww), a large scarf, a soft water bottle, a notebook, travel-size personal hygiene items and medicines, plus a small gift for the friend who hosted me. Anything I missed or regretted not taking along? Definitely not! Of course, the weather could have suddenly gotten worse, but I then I would have worn the long-sleeved top, which is pretty low-cut, with a different T-shirt each day, sometimes with a scarf, and still pretend that I have enough clothes for all occasions. I took part in a conference, went clubbing, took a river ferry, saw a pop-up opera (will blog about it later), and did many other things. I realize that I felt appropriately dressed everywhere thanks to the laid-back habits of people in the US. I′m not sure I could have managed to travel this light to Japan, for example. But hopefully I′ll learn before the next trip.